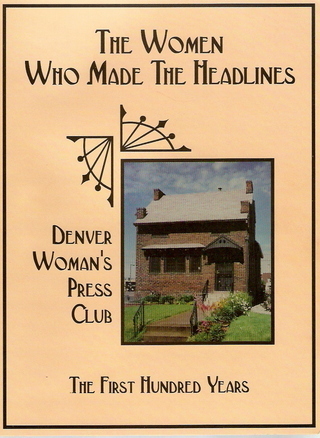 To celebrate their centennial, members of the Denver Woman's Press Club compiled this illustrated history. On March 18, 1898, reporter Minnie J. Reynolds and seven fellow writers gathered their voluminous skirts and bicycled to a home on Denver's Capitol Hill to organize the Denver Woman's Press club. The bylaws declare the club was organized to advance and encourage women in literary work, to cultivate acquaintance and friendship among women of literary tastes. . . and to drive dull care away. From this irreverent beginning, the club grew to include the movers and shakers of that day and the century to follow. Members Cle Cervi and Nancy M. Peterson served as co-editors of this lively, award-winning history, which profiles 25 Denver writers who were outstanding in thir field. Mary Coyle Chase wrote the play Harvey to make her war-widow neighbor smile. It won the Pulitzer Prize and went on to spend decades as the most-performed play in the world. Florence Sasbin had to struggle to be accepted in a male-dominated medical school, where as a student she wrote a medical text concerning the brain that was for years a standard reference. She became a professor of histology and then the first woman to head her own research team at the Rockfeller Institute of Medical Research. After retirement, she returned to Denver where she out-worked and out-foxed reluctant politicians until she transformed Colorado state health laws and won the respect of a grateful populace. Today, her lab-coated figure sits in the National Hall of Statuary in the nation's capitol, one of two Coloradans chosen to represent the state. When she was 40-plus years old, anthropologist Ruth Murray Underhill took a $500 grant and drove her old car from New York to the Papago reservation in Arizona. For three summers she lived in a tent and recorded the poetry, ceremonies and culture of a people who came to love her. The book detailing their lives was the first of 19 she would write to document and shed light on the lives of Indian people. "If you are prepared to work and study and dream and leave the result 'in the lap of the gods,' poetry is perhaps the most soul-satisfying labor you can find in the field of literature." Widowed in 1941 at the age of 46, Lenora Mattingly Weber was left to support six children. "The mortgage on the roof can be a writer's inspiration," she said. "I wrote with one hand on the typewriter and one on the cookstove." Those hands produced 100 short stories in national magazines, 14 Beanie Malone and seven Katie Rose novels for young adults, and 252 monthly columns. "I'm hunbly grateful to be a writer," she said. "I'd rather do writing than anything else. I love it." Her readers returned her love, using her books as a guide to growing up. "When I first sent a story to one of the religious magazines, it was returned with a letter saying,"We like the boy and girl camaraderie, but not when it degenerates into love." "If I didn't know the ending of a story, I wouldn't begin. I always write my last lines, my last paragraph, my last page first, and than I go back and work toward it. I know where I'm going. I know what my goal is. And how I get there is God's grace."